This time of year, I have Christmas music playing all day long in my Southampton shop. 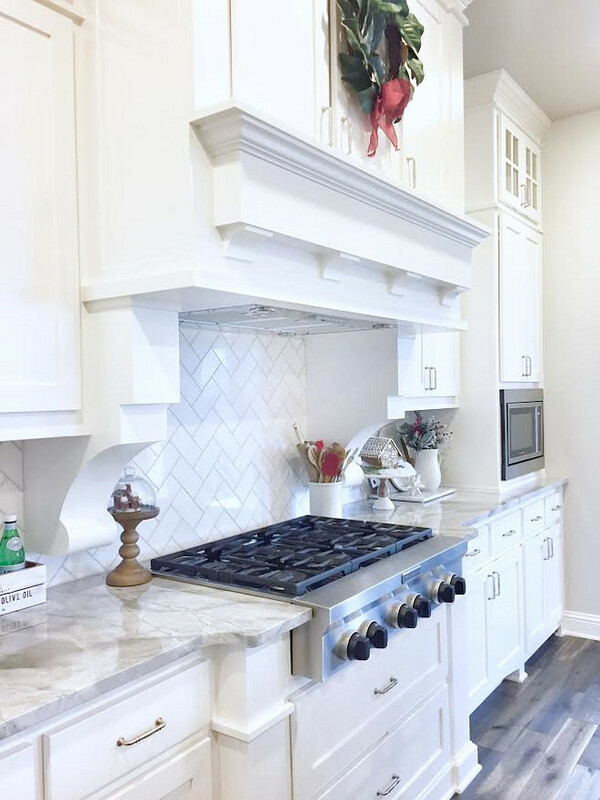 I’ve had the song “I’m Dreaming of a White Christmas” in my head for days now, and when I came across the image below on Pinterest, the song in my head shifted to “I’m Dreaming of a White Kitchen.” It inspired me to share a post with 10 different, but all gorgeous kitchens in all white. When I came across this image by Maison de Cinq, I really loved the crispness of the all white kitchen and the warmth that woven wood shade brings to the space. Of course, the greenery adds the perfect holiday touch for this time of year, too. The kitchen above also has a little holiday touch with the wreath on the range hood. You can see the whole kitchen decked out for the holidays in this post at Homebunch. It’s a beautiful post about Homebunch did on “Beautiful Houses of Instagram” where they share @mytexashouse decorated for the holidays. What you’ll find is that a neutral background like a white kitchen allows the holiday decorations to shine and really make a statement. The white kitchen by Creative Cabinet Works above as a really unique center island with stainless steel counter top which could make a kitchen feel cold with the stainless appliances, but the brass lighting and stone counter tops in the rest of the kitchen make the space feel warm. 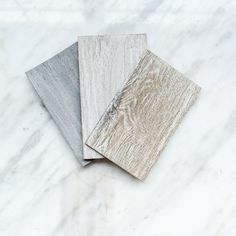 You’ll notice in most of the images I’m sharing that the floors are wood which also adds warmth that a tile floor just wouldn’t have in an all white kitchen. Rustic beams, as well as wood floors, and brass light fixtures give this one a lot of character. This kitchen has me dreaming of storage that I currently don’t have, in addition to that crisp, clean, yet warm look. The photo is via Decorpad. There is a definite trend these days to mix metals in the kitchen as shown in the amazing photo by Mandy Oliver of the kitchen done by Nicole David Interiors. 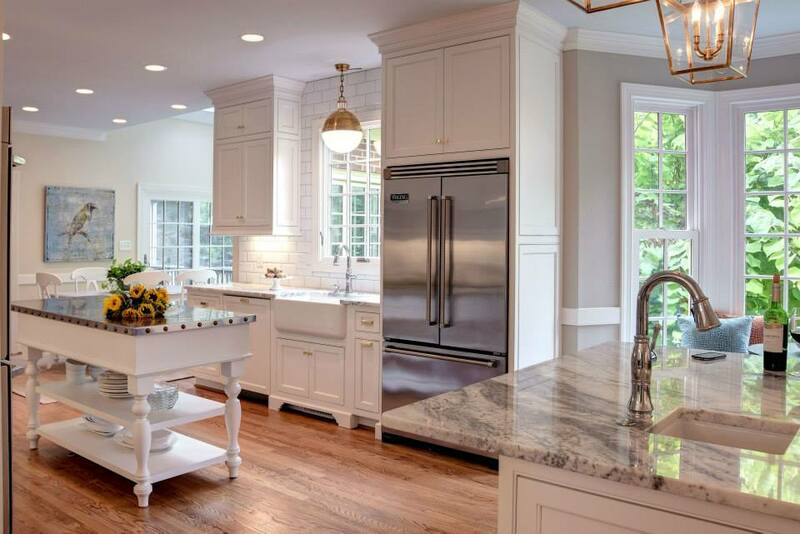 Take a look at her website to see how just how gorgeous a white kitchen can be with brass accents. The photos will inspire you, I’m sure. One of the many things I love about this kitchen is the solid marble counter top and back splash. Don’t get me wrong, I love subway tile, and it’s very popular here in the Hamptons, but if you have the budget to do something like what Nicole Davis did above, then I think you should go for it! It makes the space feel sophisticated and timeless. Here’s another white kitchen from Homebunch. 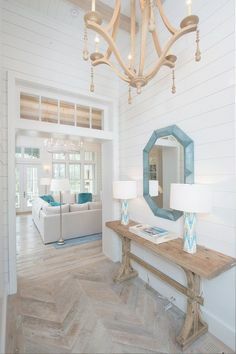 This is in a Coronodo Island beach house that has all of the coastal elements I personally love. You can see the whole house here. Even though the kitchen is white they incorporated a little color in a sea green accent tile that runs through the marble back splash which is really lovely and adds some coastal charm. I had to include a kitchen that was a little more modern, and I think this one is stunning, via Atlanta Homes Magazine. The flat panel cabinet doors, solid marble slab back splash, and stainless steel range hood are all the elements you need in a modern kitchen. 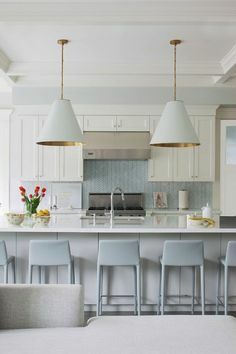 I also love the pale blue counter stools with their sleek lines. I would consider this kitchen modern as well. I found this beautiful photograph on Savvy Home. 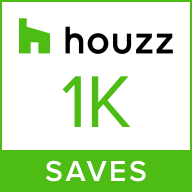 It was in a post called “7 Kitchen Trends to Consider for Your Next Kitchen Renovation”. 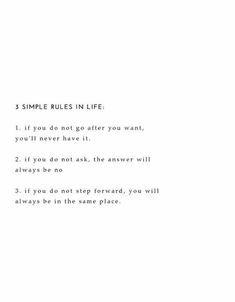 I was surprised to see the post was written in 2015 becasue so many of the trends mentioned are so current. The white kitchen cabinets are also flat panels, but there is no hardware on the doors which keep s the lines even cleaner. The waterfall style island is also sleek and modern with the bar stools in wood and brass. 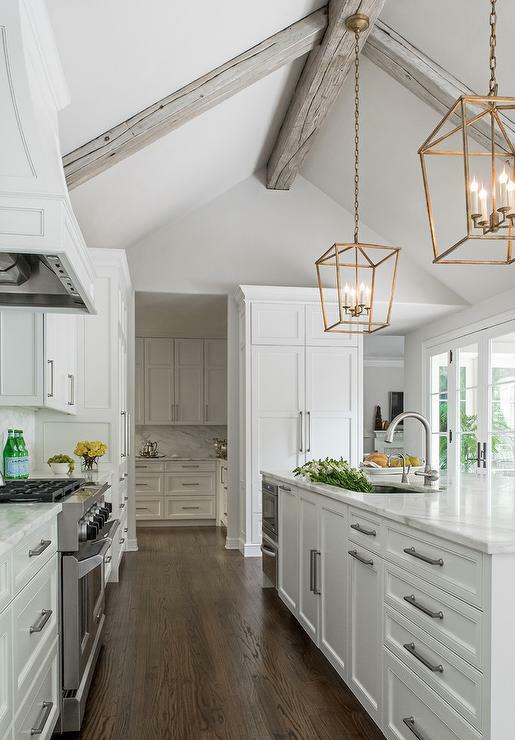 I love how the lining of the pendants over the island picks up the brass on the stools. Again, you see the wood floors carried into the kitchen adding warmth to the space. Studio McGee does an amazing job on all their projects and the kitchen above is no exception. 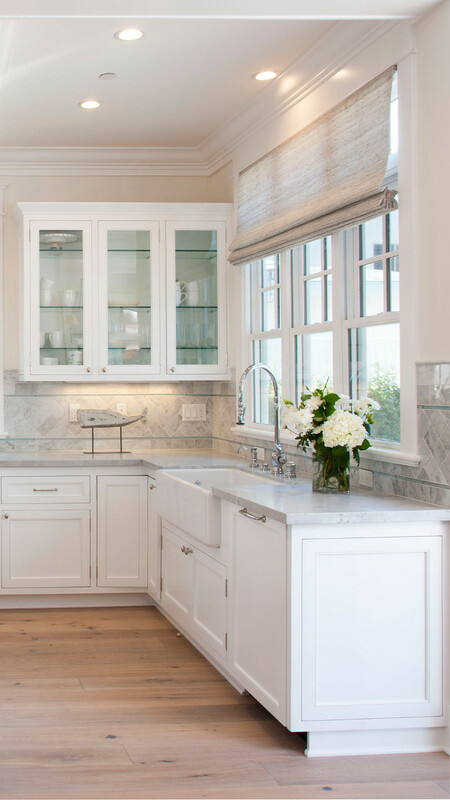 This white kitchen is a perfect example of a transitional style. It’s not to modern, but definitely feels current. The lines are clean, not too detailed, but there is great character in this kitchen. The stools area nice addition with their pale grey with Chippendale style. I would call the white kitchen shown above a “piece de resistance.” The image is from a blog post on Studio M which featured a coastal home in England. The crystal chandeliers are opulent while the large, built-in, tufted banquette is a cozy spot to sit around the natural wood table large enough to seat 10. While this space may be “over the top” for some, I think the details are stunning and timeless. Besides the color of the kitchen cabinets, there is a common thread to the images that I’m sharing. While these kitchens have different styles, they all have a welcoming atmosphere. The wood floors are a key element to making the kitchen feel warm, which is important. Our kitchens tend to be a place to gather and should not feel cold and sterile. You may also notice that while the cabinet style may be similar in these kitchens, the back splash and counter top can change the look completely. This is also the case with cabinet hardware and light fixtures. Are you dreaming of a white kitchen? If so, do any of the 10 images in this blog post strike your fancy? Do you like subway tiles or a solid marble back splash? What do you think of brass accents in the kitchen? Most of all, whether you’re dreaming of a White Christmas or a White Kitchen, I wish you all a Merry Christmas and Happy, Healthy New Year!